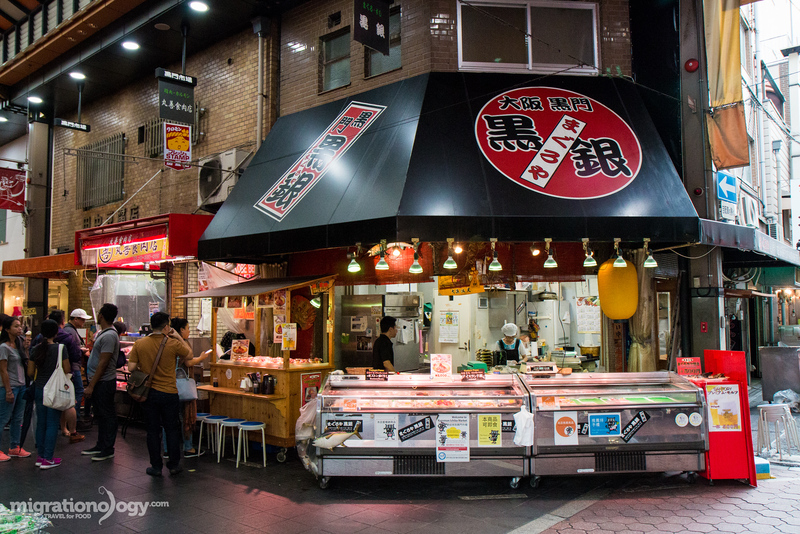 Kuromon Ichiba is one of the most well known central food markets in Osaka, Japan. 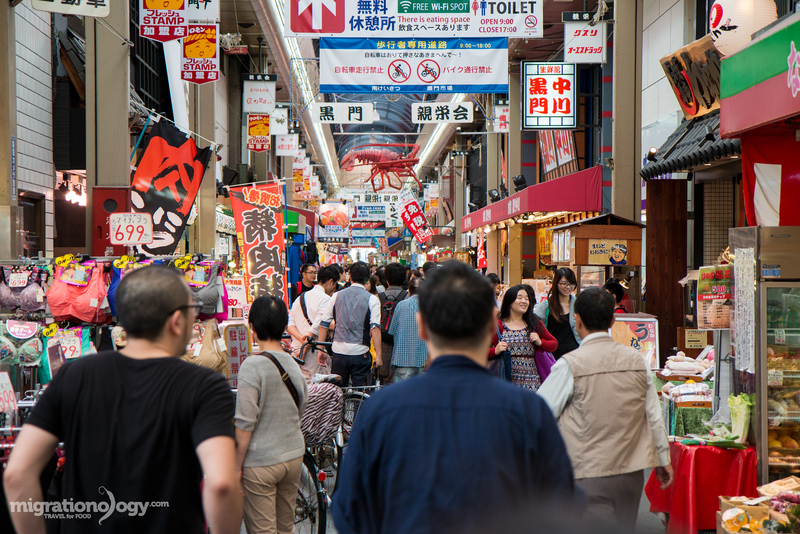 And while it’s the type of place that could be quite touristy, something about the entire market remained very pleasant, quiet (though busy), and I thought it was an excellent place to get started eating in Osaka. In this blog post about Kuromon Ichiba Market, I’ll share the things I ate and saw while walking around the market. According to Osaka Tourism, Kuromon Ichiba Market has been around for over 170 years, preserving the food and culture of Osaka. One of the things I really loved immediately about visiting Kuromon Ichiba Market is that, despite it being a little touristy now, it still remains at the same time a very local a neighborhood market. People living in the area come to the market to do their shopping, buy produce and fish, new clothes and shoes, gadgets, and all sorts of other things available. While some of the shops are big and commercial, many others are still mom and pop family run businesses. And although the majority of the market, or the main focus of the market is on fresh food (both groceries and restaurants / readymade food), there are quite a lot of other random stores as well. Need a new bra? You’re covered at Kuromon Ichiba Market! 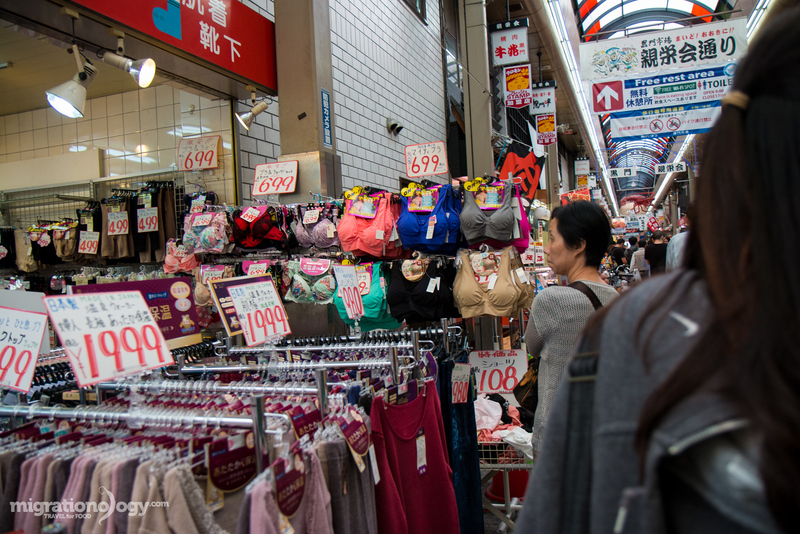 There are also a number of supermarkets scattered throughout Kuromon Ichiba Market. One of them seemed to be a high end gourmet market, selling prized fruits and vegetables, and steep prices to go with them. The other supermarket was a little more on the budget side, including all the things most supermarkets carry in Japan, plus a nice section of sushi and pre-cooked food. 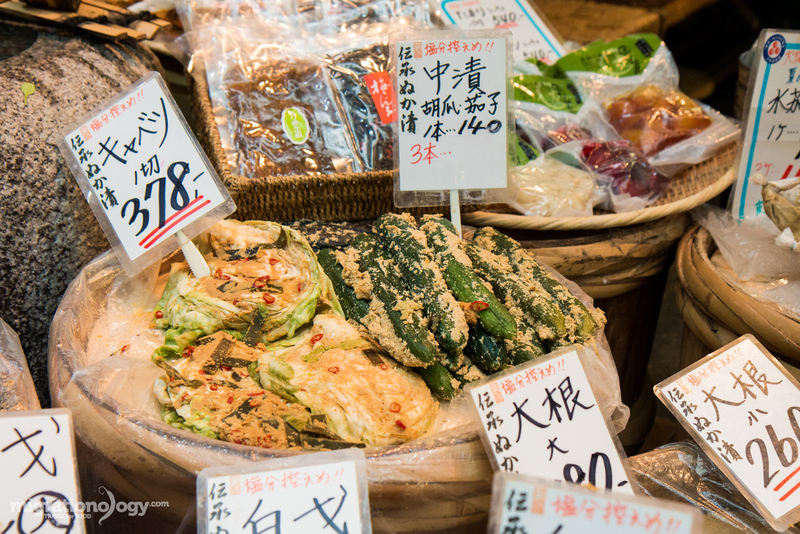 One of the things that never gets old in Japan is the beautiful assortment of fruits and vegetables. Although they can cost a shocking amount, they are still really nice to see and to just imagine how juicy and sweet they taste. 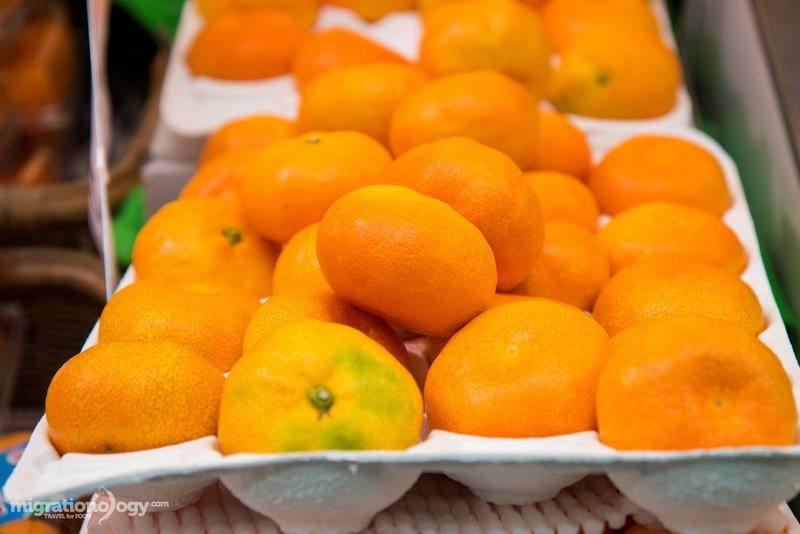 These tangerines (maybe?) weren’t even in the class of the really high class fruit like the grapes and honey dew melons, but they were still so vibrant and pretty. At the market there were also a couple shops selling home-made Japanese pickles and preserved items, all of which looked good. 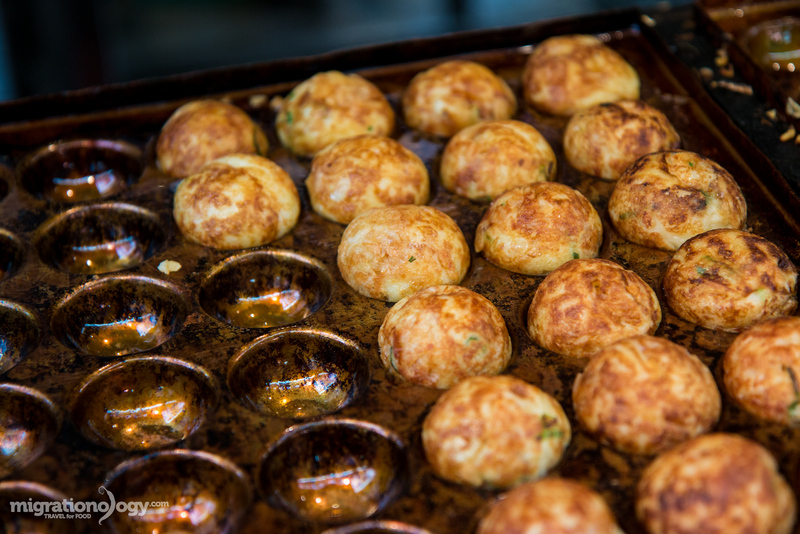 As soon as we arrived to the market, we decided to try some takoyaki at a prominent takoyaki stall right in the middle of the market. The stall, which I didn’t know at the time, but only found out after doing some researching, was Takoyaki Wanaka (たこやき道楽 わなか 千日前本店), one of the most famous brands of takoyaki in Osaka with multiple branches around the city. 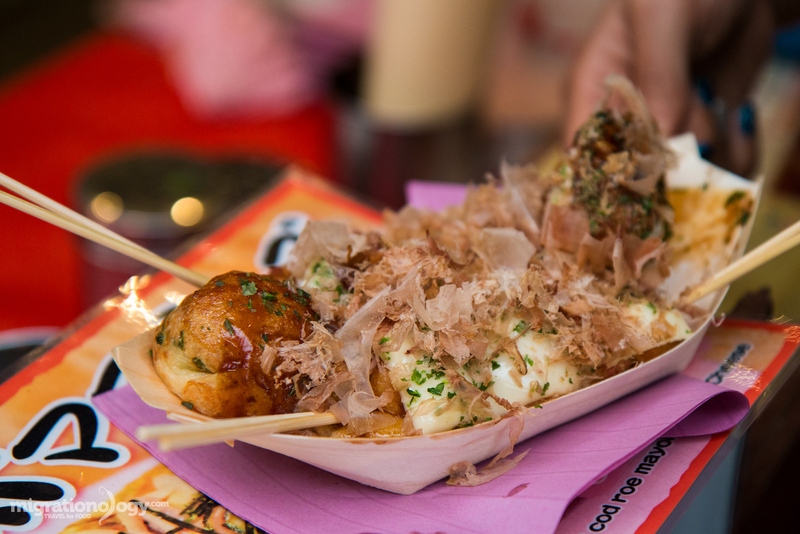 We decided to go big, and ordered the full option takoyaki combo, with cheese and all the toppings. I guess a layer of good quality cheese over the top of the little octopus pancake balls was only in my imagination; After seasoning the takoyaki with a layer of sauce, a good’ol processed Kraft single was placed on top. It wasn’t exactly what I was expecting, but we took it. The takoyaki proved to actually be one of the better versions we had during out trip to Osaka, and even my wife agrees, and she’s much more of a takoyaki connoisseur than I. Part of the reason it was so good was that it was completely fresh, taken right off the griddle, seasoned, and served… not because of the piece of processed cheese. I have a lot of favorite foods, but when it comes to seafood, one of my absolute favorite things from the ocean are scallops. 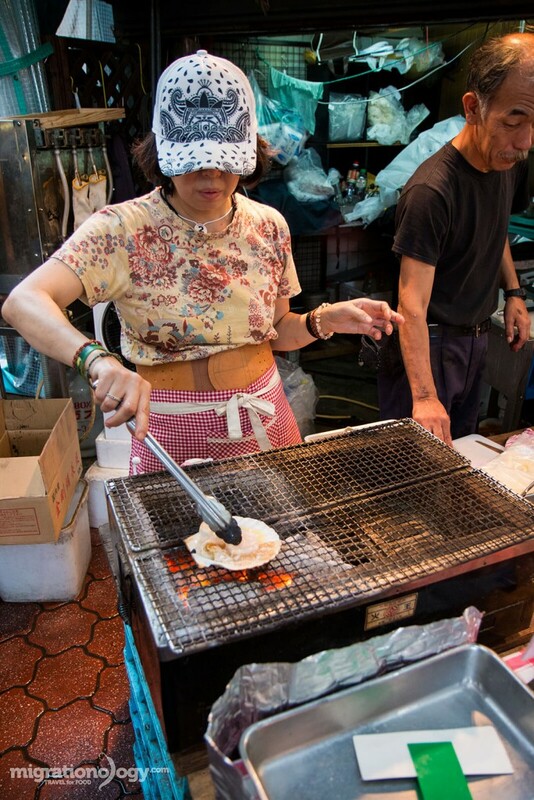 Very similar to what I tried in Tokyo a year before (just this time without the surprise cod sperm), there was a small shop on the corner, a mom and pop style shop, that had a few stacks of fresh scallops ready to be cleaned and grilled. Dwight and I couldn’t resist, and we each got the 750 Yen per scallop size. 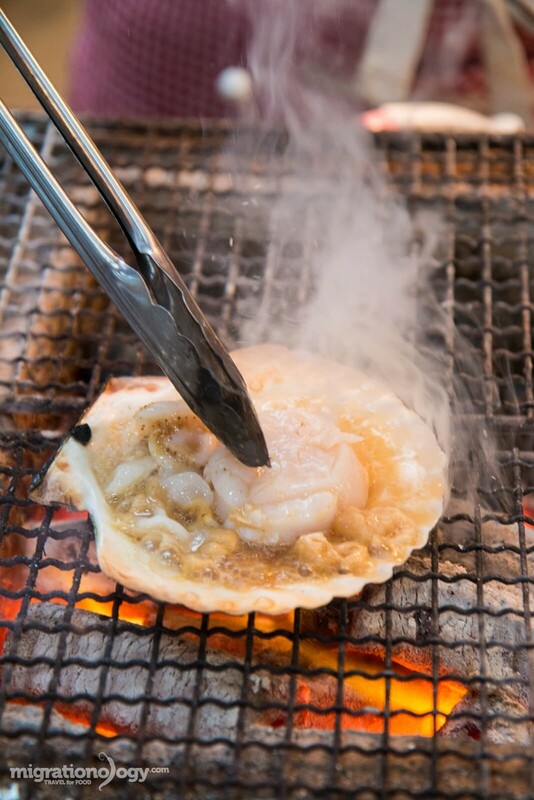 The scallop was first popped open, cleaned, then put back into half of its shell, and then set on the grill. 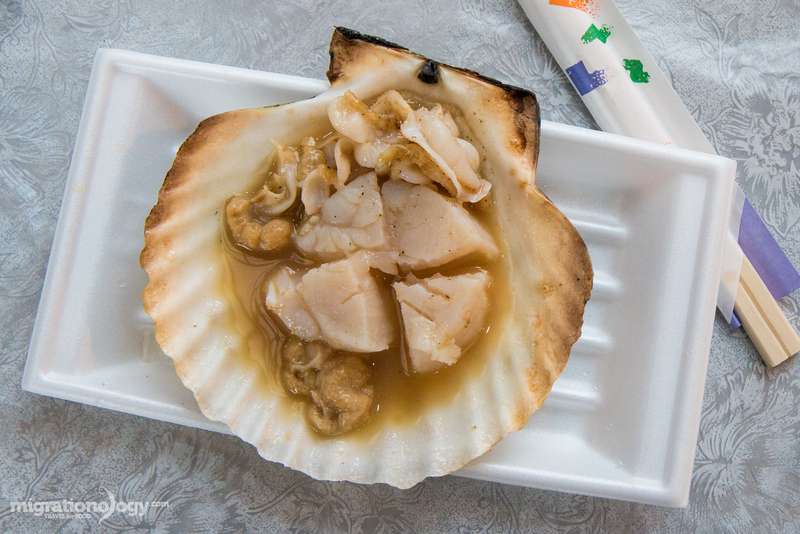 It was seasoned with a dab of butter, and a spray of some soy sauce (I think, or something in a spray bottle), and it sizzled in its own scallop juices and butter for just a minute until cooked. The scallop was unbelievably delicious. The meat was firm yet soft and silky, and it had a natural sweetness to it, with a faint soy sauce and roasted butter aroma and flavor. It was so good I probably could have just called it a day, and just stood there at Kuromon Ichiba Market and not moved until finishing off their entire stock of scallops they had sitting on the front table. It’s a little expensive for a single little treat, but if you love scallops, I think you’ll agree that it’s a worthy investment. Since we went to Kuromon Ichiba Market on our first day just after arriving in Osaka, along with the other snacks, I still needed to have my first bite of tuna. After seeing a giant tuna head, and a table filled with the tuna overflowing on little arranged trays of sushi, I had to make a stop for our next snack at the market. Looks at that tuna overflowing! 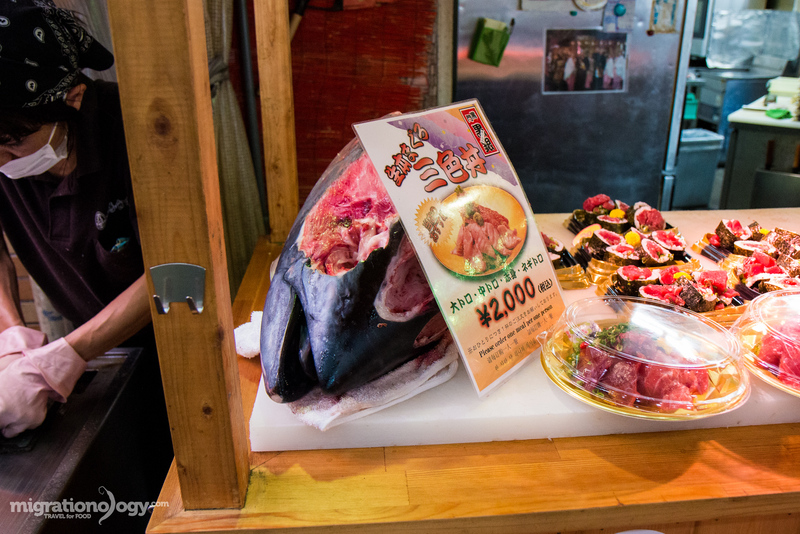 The stall had a section of takeaway sushi and sashimi, but there was also seating for about 4 people at a time to sit there at the bar counter seating, and look into the face of the giant tuna while chowing down. 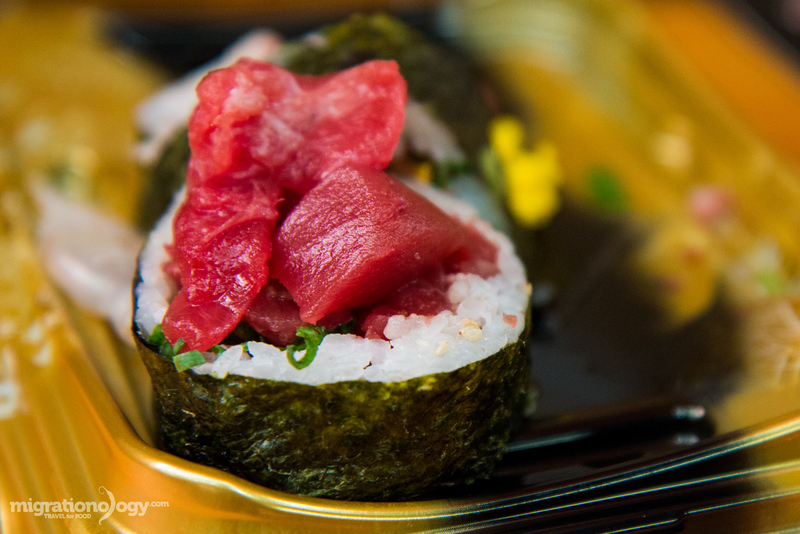 We grabbed a couple front row seats and bought a plastic little box of rolled sushi that was overflowing with tuna. 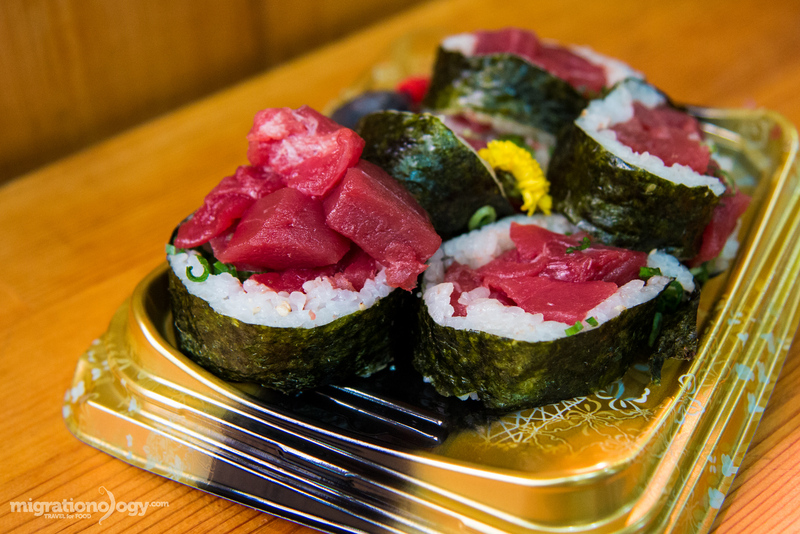 This time the tuna appeared to be mostly the red dark meat, known in Japanese as akami, as opposed to the white creamy colored tuna belly. Just on my first day to Osaka, those few bites of seafood we had at the market, already made our entire trip to Japan worth it. 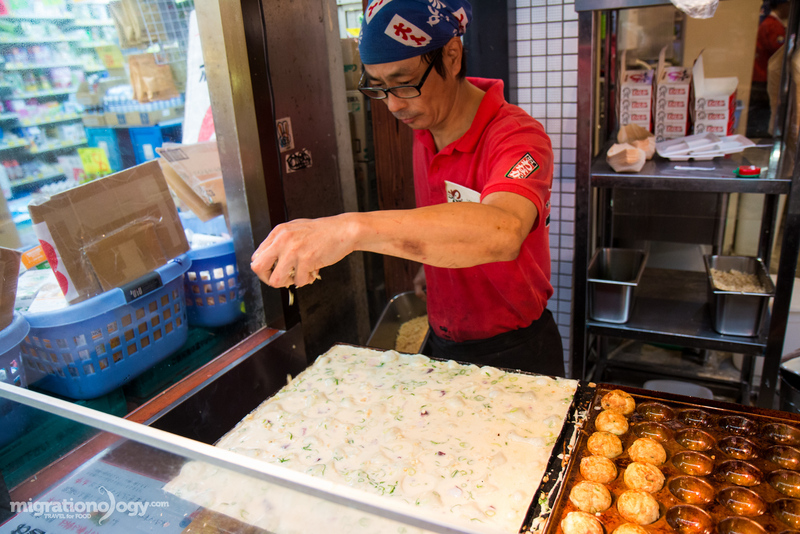 I only saw one main and prominent stall selling oden when I was walking through Kuromon Ichiba Market, but it would be almost impossible to walk past without noticing it. Oden is a special winter time Japanese food, and it includes a bunch of different ingredients like daikon radish, and a variety of skewers and meatballs and fish balls, all slowly bubbling in a vat of stock. While Japanese food is all about beauty and presentation, oden pushes all that beautiful food presentation aside, and just focusing on the comfort. 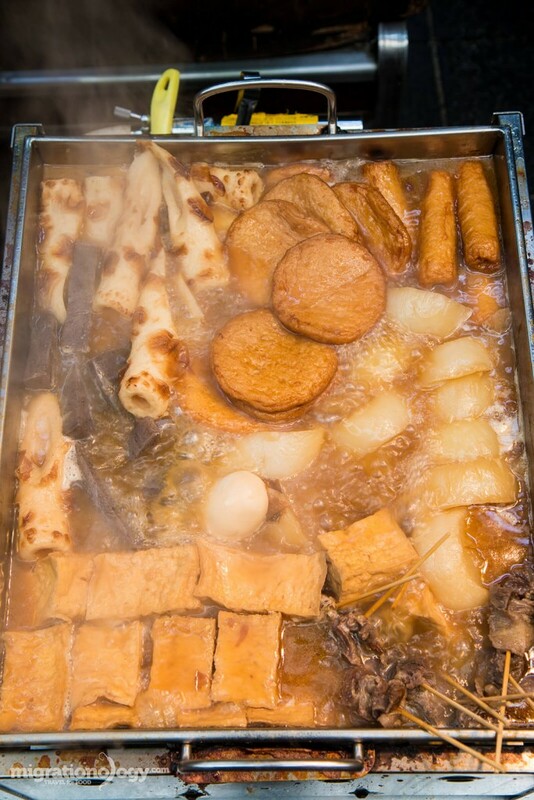 What sticks of oden would you like? 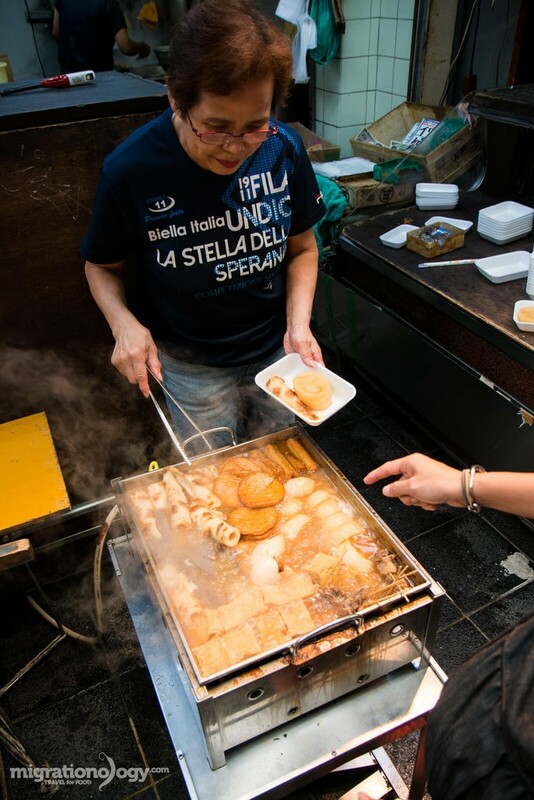 One of the most interesting things to me is that oden is a Japanese food that can be found at street food markets like this and even at convenience stores like 7-Eleven, but it’s also a food that’s served at higher end, even Michelin starred restaurants. 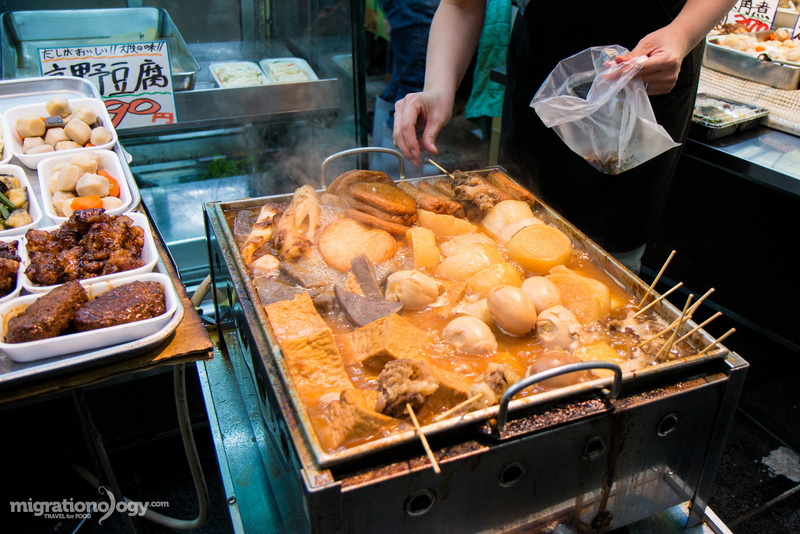 But of course, at Kuromon Ichiban Market, it’s the street food version of oden, and I’m pretty happy with that. Something so bubbling and so interesting was too hard for me to pass up. 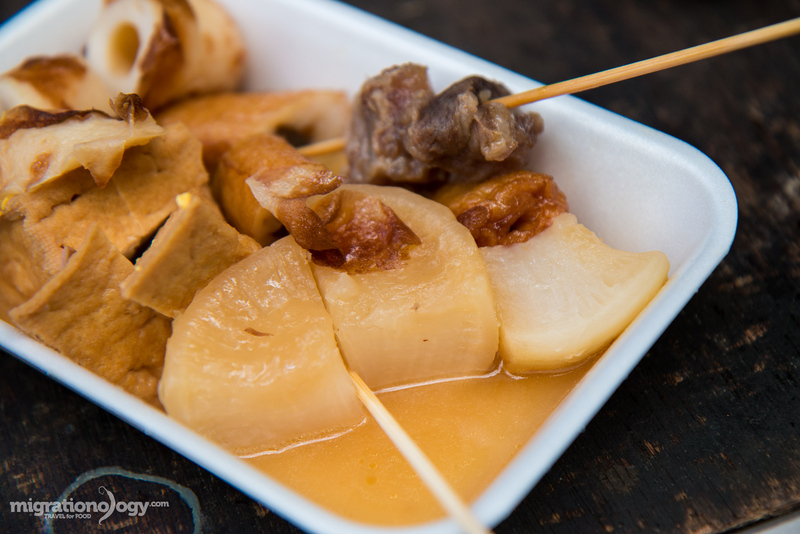 The pieces of daikon radish, which are a must when you eat oden, were nice and juicy, naturally sweet, and filled with the broth of the oden pot. The broth was light and soothing, nothing strong in flavor, but with just a tiny fish flavor and maybe a hint of a smokiness as well. I have to admit, I was going to avoid the circular tubes of what looked like fish cake in the pot… and I was going to stick with more of the familier items like the meat and daikon. 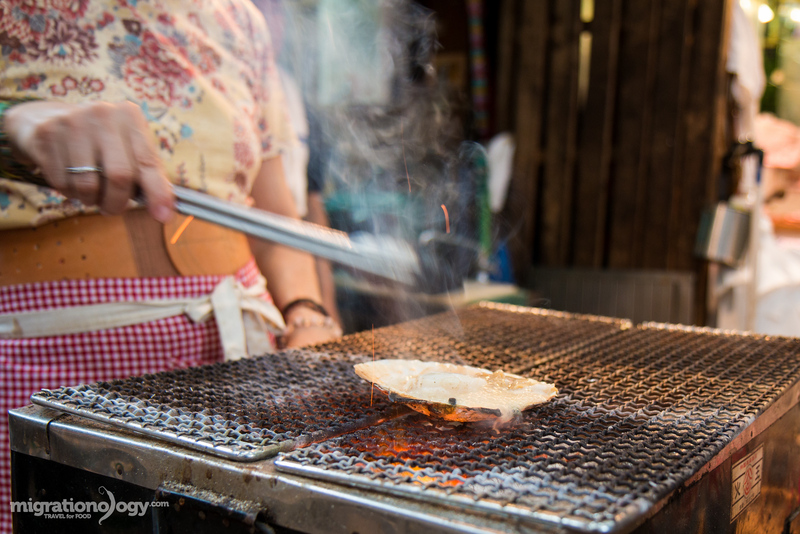 But the friendly owner of the oden stall, as I was contemplating what to order, smiled and said something along the lines of, “you have to get the chikuwa,” grabbing one of the circular hot dog looking things with her togs and placing it onto my tray – and I nodded. 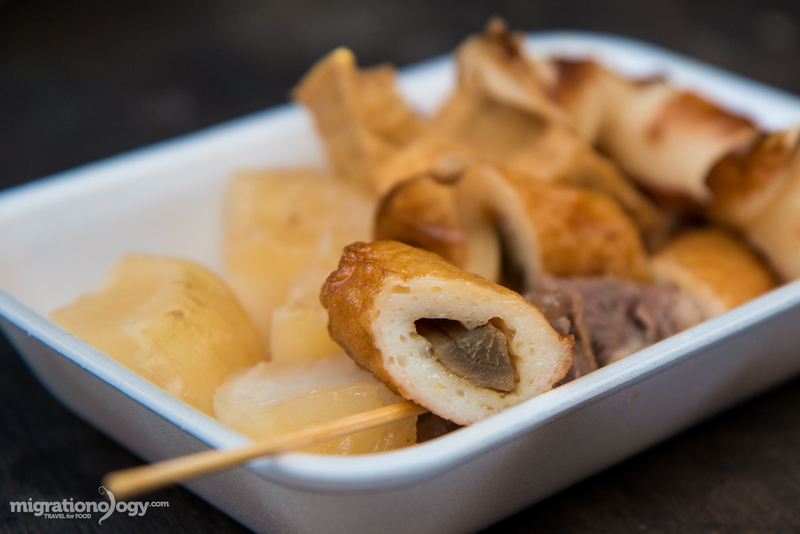 Along with radish, tofu, and the fish cake rolls, I also couldn’t resist getting a stick of beef oden, which was sitting in the corner, and so tempting. I’m glad I had it. 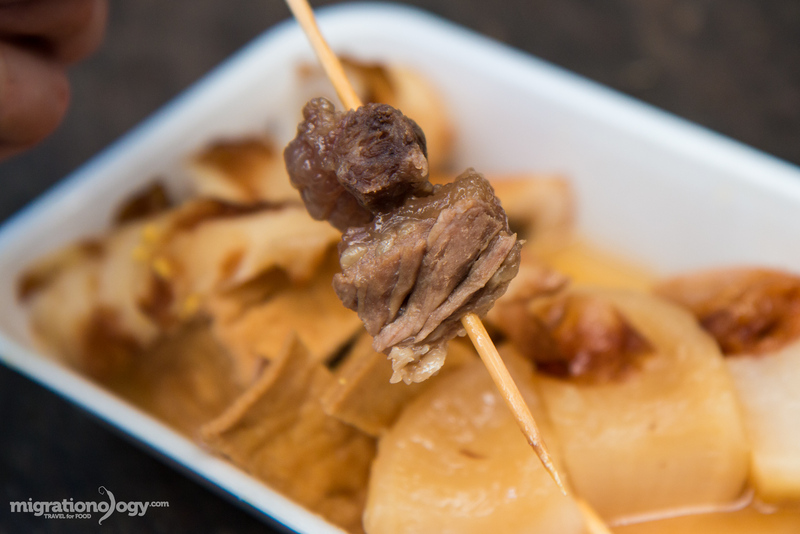 Again, even though it wasn’t the most attractive skewer of meat, like grilled Japanese yakitori, something about the beef oden was so flavorful – maybe because it was gushing with all the oden juices, and it was very tender as well. Again, just like at the rest of the food stalls we tried at the market, the lady selling the oden was really friendly and made the experience visiting the market and eating oden even better than it already was. Kuromon Ichiba Market is an excellent place in Osaka to wander around and to get an edible introduction to the food and culture in Osaka. 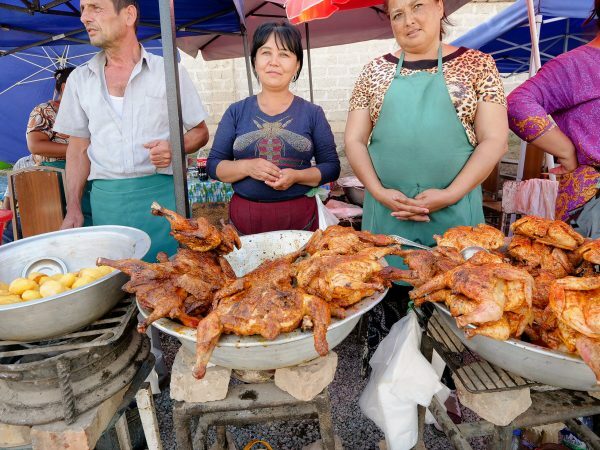 What I enjoyed most about visiting the market and eating, was not only the food, but also how friendly the entire market was. The vendors were really hospitable and the entire market street just had a pleasant feel to it. The only disappointing thing about visiting Kuromon Ichiba Market was my budget. There are a lot of small seafood snacks to try, and if you keep on eating and eating, you could wind up spending quite a bit (it’s not a rip-off but merely because of the quality of seafood). But whatever you choose to eat at Kuromon Ichiba Market, you can be assured it will be fresh, great quality, and delicious. How to get to there: And luckily since Osaka has such a hassle free public transportation system, as in most of Japan, you can easily get there by Subway. Take the Subway to Nippombashi Station, take Exit 2, and walk for about 2 minutes, veering to the left, and you’ll be at the market. Alternatively, it’s also very close to Namba, and just a 5 – 10 minute from Namba station as well. Opening hours: Each Shop has different opening hours, but most are open throughout the daylight hours. If you go anytime from about 8 am – 5 pm you’ll find most shops open and serving food. Have you been to Kuromon Ichiba Market in Osaka? Anything else you tried? Thanks for sharing your food suggestions at Kuromon market! We’re planning on going to Japan this summer and just booked an Airbnb place within 5 min walk of the market. Very excited to try all that food! Just went to the market today (A Sunday in a chilly February). Was there from 9am till about 11am. When I reached about 9am, I would say that 80 odd percent of the shops are open. 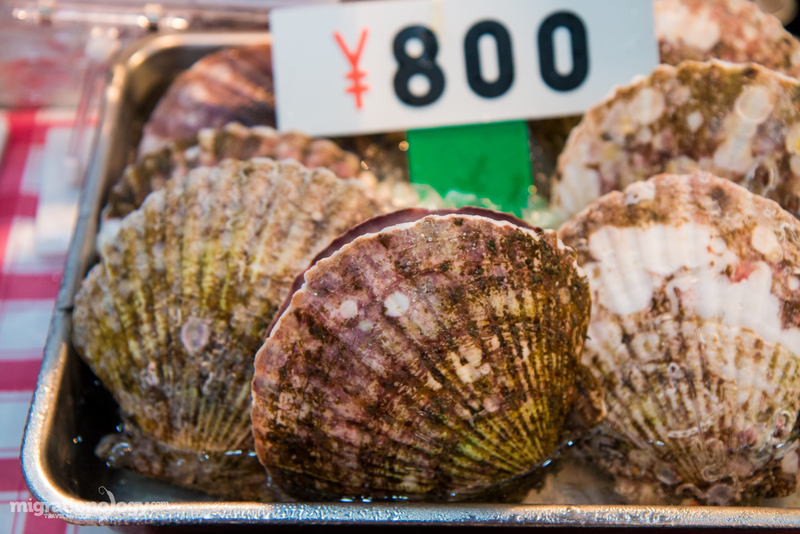 Take Mark’s recommendations for the food in the market especially the scallop! Totally the best! Hey Daryl, awesome to hear you enjoyed this market too! Mark, I stayed up last night watching your videos in preparation for my next trip to Osaka! Thank you for sharing all your favourite food places and experiences. 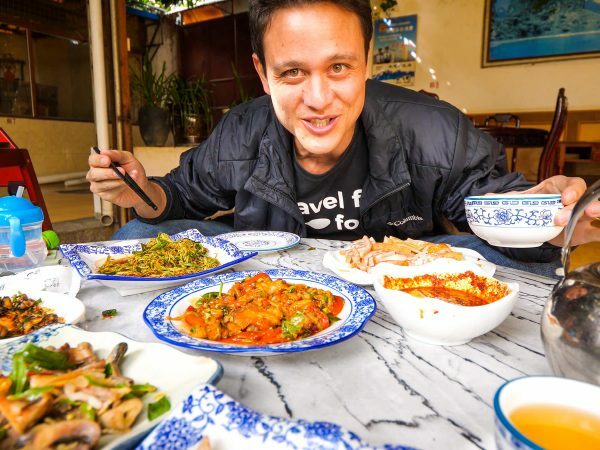 It is wonderful to see someone who is passionate about experiencing food. I’ve been to Osaka five times and still haven’t made my way to Kuromon market and I am now kicking myself.. it’s moved to the top of my list! Oh, it should be a must explore on my list. On days when i don’t have much of an appetite but still need to eat all i needed to do was flip to your website and my almost immediately my stomach get growling for food. Thanks mark you one it differently. Awesome to hear that, thank you Kenneth! Thank you very much Izy! Hahaha. Sitting in my hotel room figuring out what foods to try and what the best time to go to Kuromon; I happened across this article. So yes, I will be going, in about an hour or so. Thanks for the tips! Hey Stephanie, good to hear that, hope you had an amazing time visiting Kuromon Market. Enjoy the food and have a great time in Osaka! Wow! 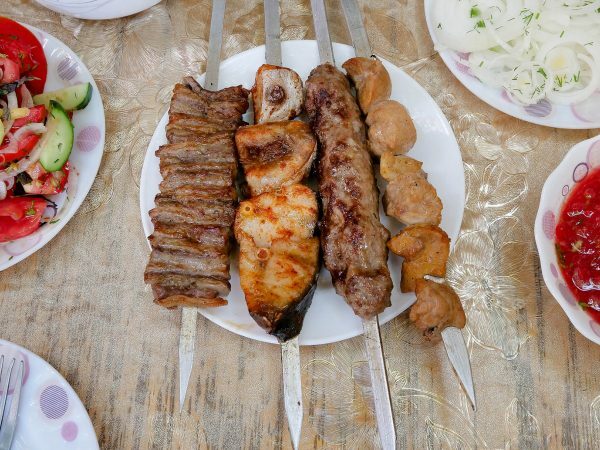 I wasn’t hungry at all… until I saw the gorgeous photos here. Amazing stuff! Off to order some take-away sushi! Thank you very much for reading Fernando! Mark, what camera do you use for taking food photos? Do you have any tips? Hey Piotr, I used a Canon 70D for these photos with a 17-55 mm lens. Your photos are amazing! As for food, I just like to get all different angles of the food, and always like to use a large aperture to really focus in on a small portion of the food – the details. Thanks! Hi.I happened to find your videos on YouTube a few weeks ago,since then I love watching them,especially your recent trip to Osaka,Japan. I’m a Japanese and from Osaka,so I was really interested in the restaurants,shops you visited. The way you eat,and reactions when you enjoy eating brings me a smile,and happiness. Keep it up Mark and looking forward to watching the rest of your videos,and blogs. Hi Hiro, thank you very much for your kind words and for watching our videos, really appreciate it. Great to hear you’re from Osaka! 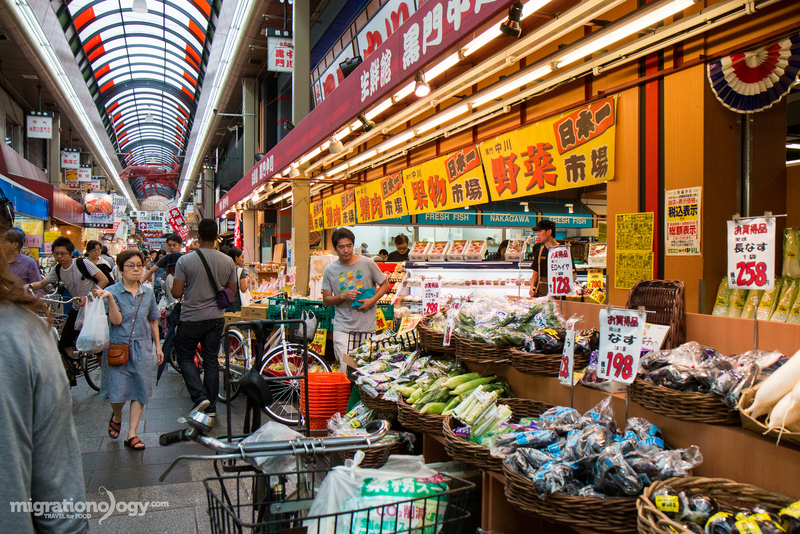 Love Asian food markets … haven’t been to Japan yet, but I’ll make a point to drop by this market when in Osaka! Yum this all looks so fresh and delicious..sometimes it’s worth spending a little extra for good quality! Super awesome market. Thank you Nick, yes definitely agree with that!